So what do you do with a bunch of Primitive Snowmen ornies that you end up not putting on your Christmas tree this year? Well, you send them on a sleigh ride of course! That's what I did anyway. I have a lot of primitive snowmen ornies, and since I didn't do a primitive Christmas tree this year, I decided I needed a fun way to display some of my favorite snowmen ornies. So I used another decorative sleigh I had in my Christmas decor and put a bunch of snowmen in it. I've got this sleigh full of snowmen sitting on my dining room hutch. I love their happy little faces! 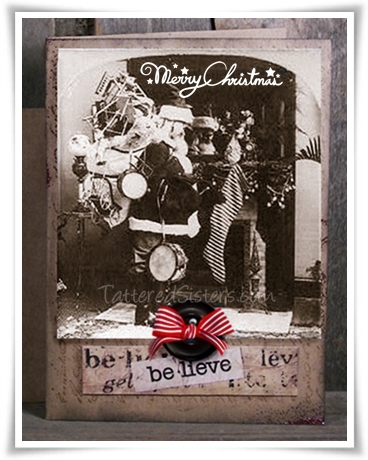 I felt like creating some Altered Art the other day, so I came up with this Grungy Primitive Christmas Believe Card. I used a Vintage Photo of Santa, added to a brown Kraft card that I made good and grungy using distress ink (by Tim Holtz). I also used a text rubber stamp on top of the card. I added a 'Believe' word sticker, an old button, and a touch of ribbon for a pop of color. Just a cute little primitive Christmas card, ready for giving. I thought I would create something new to add to my Shabby Prim category, and something that would fit in with December for a Primitive Christmas, so I came up with this Shabby Prim Pips and Flowers Gift Bag. This is created with a pre-made plain muslin bags (I never make my own muslin bags, just FYI). 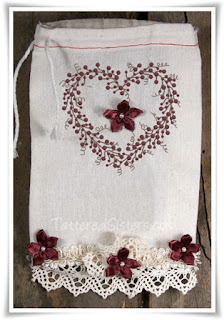 As always, you can find a link to my muslin bag supplier on my Primitive Crafting Supplies page. The pip berries heart wreath was added with an iron-on. The flowers, lace, and trim were all sewn on by hand. I think this would make a sweet little gift bag, don't you? Then afterward, the recipient can use it for all sorts of things. So add a gift inside and it becomes two gifts in one! I want to post this other Vintage Photo Fabric Ornie before I forget about it. 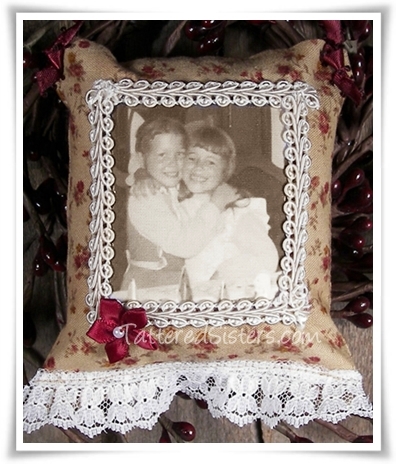 This is one I made that has a vintage photo of my sister and me when we were little. I'm the one on the right in the photo. I think I was about 6 or 7 in that photo, so my sister would be 8 or 9. It's not totally a primitive ornie, I realize. 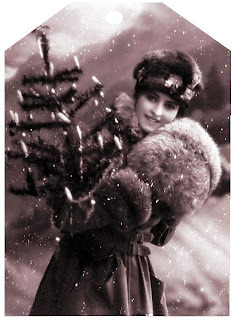 But it still looks cute on a Primitive Christmas tree. :) When I have all my handmade Primitive Ornies on the tree, it fits right in. One of these days I think I'll make some with photos of my daughter and grandkids too. As I was decorating my Christmas tree after Thanksgiving, I pulled out some Vintage Photo Fabric Ornies that I had made 2 Christmases ago. I made two sets of them, one for me, and one as a special gift for my mother. 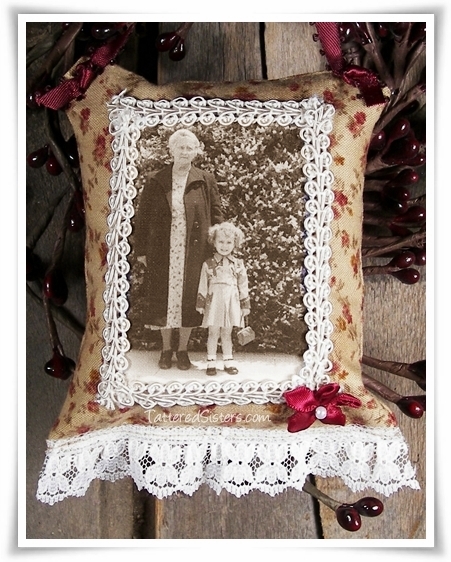 Since my mother passed away this year, these vintage and almost Primitive Ornies are even more special to me. So I thought I'd share them with you. I used scraps of a vintage rose-look fabric and lace, along with some trim to make these. Very simply to make. And the photos were printed on ink jet fabric, which I bought at an office supply store. The top ornie shows a photo of (from left to right) my great grandmother, my mother, and my Nana (my mom's mother). They were on a trip to New York City. And actually I found out on Mom's last visit last year that the Statue of Liberty was in the background when this photo was taken--it's just no longer visibile in the old photo. 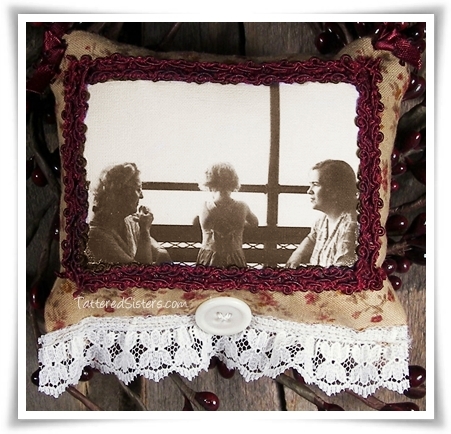 In the bottom photo are my great grandmother and my mother. They were very, very close, so this was a very special ornie to make for my Mom. She said she cried when she opened these. And here I sit crying as I type this. I miss Mom so much, and it's so difficult at Christmas time. Her tree was still up in January...she had gotten sick and passed away so suddenly, she didn't have a chance to take it down. Her set of these ornies were still hanging on the tree. I gave them to my sister so she would have a set too. But enough tears! I am going to try and focus on the many wonderful memories I have of her and my whole family. And hopefully Mom can help me from Heaven to keep my happy Christmas face on. :) I have another ornie I made for my sister as well. I'll post that another day. In the meantime, I hope these give you a little creative inspiration. 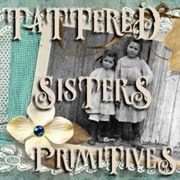 Are you trying to think of some fun Primitive Gifts you can give this year that don't cost a lot? How about some Snowballs in a Jar? 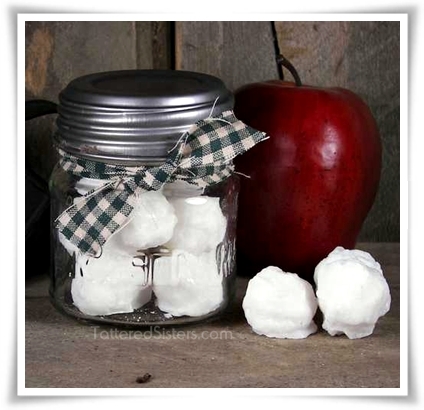 All you need to do is get some Primitive Wax Melts that look like snowballs and put them in a jar. 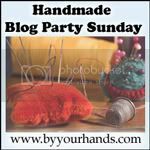 Add a bit of homespun, and you have one super easy primitive gift ready for the giving! What could be more fun that snowballs that will not melt...well, at least not until you want them to.